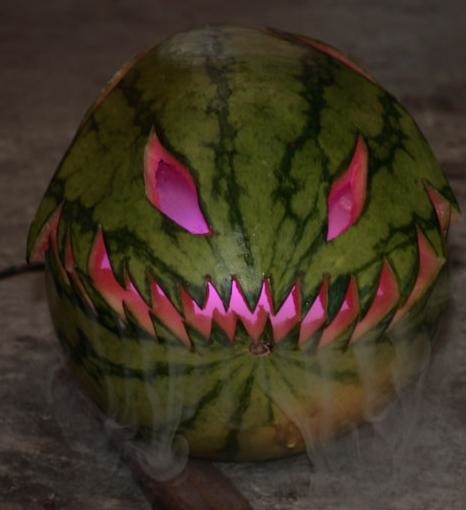 ASK THE EXPERTS: THE CASE OF THE HAUNTED WATERMELON - What About Watermelon? Halloween is upon us, so I’ve decided to post this bizarre Q&A about a mysterious exploding watermelon. For optimal effect, read it with the lights off and a watermelon lurking in the next room. ED ASKS: I had a watermelon sitting on the kitchen table when all of a sudden it split and began to squirt its juices as far as seven feet. What would cause this? Wow. That sounds pretty bizarre, Ed. So bizarre, in fact, that if I found myself in that situation, I’m not sure if I would find it funny or if I would run screaming into the other room. I’ve heard of watermelons splitting open and spewing juices and/or foam before. I’ve even heard of watermelons “exploding.” For some reason, whenever I read stories about watermelons doing these types of things, I get the same feeling inside that I do when I read stories about encounters with ghosts. For an answer to your seemingly supernatural question, I turned to an expert in weird watermelon occurrences, Dr. Penny Perkins-Veazie. She’s a plant physiologist and professor who’s pretty much seen it all when it comes to the strange things that fruits and vegetables do. A breeder once described a scenario in which visitors were so enamored with these cute little watermelons that they loaded up the station wagon, only to have them explode (and I do mean explode!) all over the car. Watermelon splitting (or exploding) can be caused by the “exploding gene,” which is found in many of the heirloom varieties, or from increased water turgor in the watermelon. Sometimes just placing the fruit on a surface, bumping it, or touching it with a knife will cause an immediate pop on the side. Of course, the other reason watermelons can split is because of bacterial infections inside the watermelon. Like many fruits, watermelon are susceptible to certain decay organisms and wild yeast. When this happens, it can lead to a fermentation process inside the watermelon. Pressure can build inside, causing the watermelon to split and erupt like a volcano or to foam uncontrollably. So there you have it, Ed. You’ve either got a watermelon with an “exploding gene” or a bacterial infection. I asked Dr. Penny if ghosts could somehow be responsible for your watermelon’s bizarre behavior, and she stood by her previous answer. I’m not saying your watermelon was haunted, but I feel compelled to offer that as a possible explanation. UP NEXT: What should my 2015 New Year’s resolution be?